There are around eight million Condensing Boilers installed in Britain’s homes. In theory this type of boiler will operate at around 93% efficiency compared to the 75% efficiency of older type of boilers. This reduces both the carbon CO2 emissions and reduces the average annual fuel bill on average by about £200. However, the increased fuel efficiency claims are theoretical and may not be achieved in reality, as these boilers seldom operate at maximum efficiency. In a traditional boiler, around 25% of the heat is vented out through the flue in the form of hot steam and CO2. 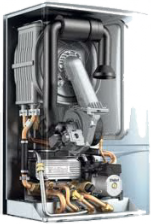 A condensing boiler works by harvesting the heat normally lost through the boiler flue by condensing the steam into water and feeding the heat normally lost back into the system. To do so, heat returning from the radiators back to the boiler needs to be below 55°C for the process of condensing steam into water. In most cases the returning water is around 10°C higher meaning the fuel savings and increased efficiency are not fully realised. 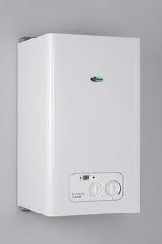 As all new homes built after 2005 that have a gas boiler are heated using a condensing boiler, the new home owner would be well advised to take out boiler breakdown insurance cover after the boiler manufacturer’s warranty and NHBC two year warranty has expired. This will cover you for the cost of parts and labour (excluding the first £50 excess). However, some policies will only cover you for £200 towards the cost of a new boiler if the existing boiler is “beyond economical repair”. Typically cover is available from as little as £6.00 a month. Alternatively, the cost of a call out can be as high as £200 - £300 plus VAT for those without boiler cover! During very cold weather, when a fully working boiler is essential, is the time when condensing boilers are most likely to cut out without warning. The main cause of the breakdown is usually caused by the freezing of the condensate waste water pipe at the back of the boiler, which normal boilers do not have. This then shuts down the system and often causing permanent damage. British Gas give advice on how to thaw out and unblock the condensate pipe at www.britishgas.co.uk. British Gas say that condensate outlet pipes are now installed internally wherever possible to eliminate potential freezing. There are some things you can check and fix yourself when troubleshooting boiler problems although you should never attempt any GAS work on the boiler yourself. 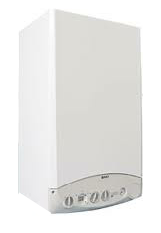 An older style balanced flue gas boiler can be expected to last up to 20 years provided they are regularly maintained. Combi boiler should last around ten years as they suffer from limescale build up. However, a newer condensing boiler has a much shorter working life, even if the boiler is regularly maintained, the boilers are not usually expected to last more than 3 to 6 years. It is normally recommended that if they suffer a break down after four years, it is normally more economical to replace a condensing boiler as the cost of parts can be horrendous. A contributory factor in the premature demise of the condensing boiler is the acidity of the condensed water. It contains dissolved nitrogen and sulphur oxides, which leads to corrosion of the more delicate boiler components which also often a cause of breakdowns. In conclusion, bearing in mind the boiler replacement cost every five years, the higher cost of replacement spare parts and breakdown call out charges, can be higher than any possible savings through increased efficiency. Alternative heating technologies can offer better savings. For example, air source heat pump systems have a life span of 15 to 20 years if they are professionally maintained and reduce running costs over gas by around 30%.